These cookies are a staple of mine that I bust out whenever I feel like a quick batch of cookies. Except that I always forget that they're not necessarily as quick as you'd like, because you do have to refrigerate the dough for 1-3 hours. Details, details. I have not a clue where I first got this recipe, because doing a quick Google search, most of these are not quite the same, and never ask for the dough to be refrigerated, which I think is an essential step. I guess we will just pretend it is my own special cookie genius! Yes, that's it. A staple cookie recipe that has just the right amount of peanut butter to chocolate chip deliciousness. Cream the butter, peanut butter and sugars until light. Add the egg and vanilla and beat until fluffy. 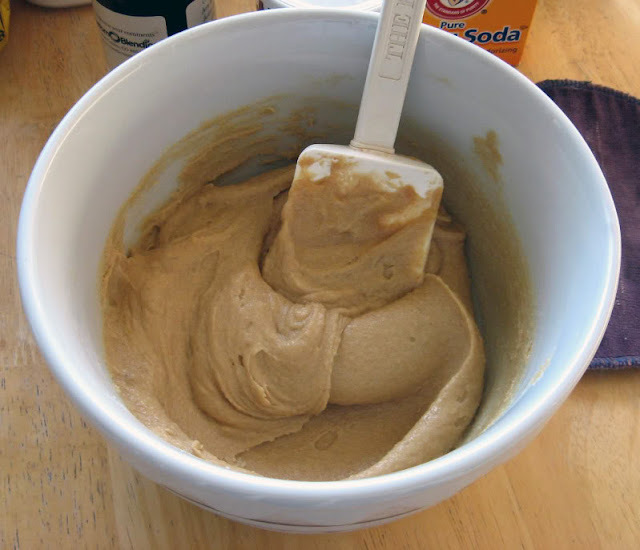 Whisk together the flour, baking powder, baking soda, and salt together well in a separate bowl. 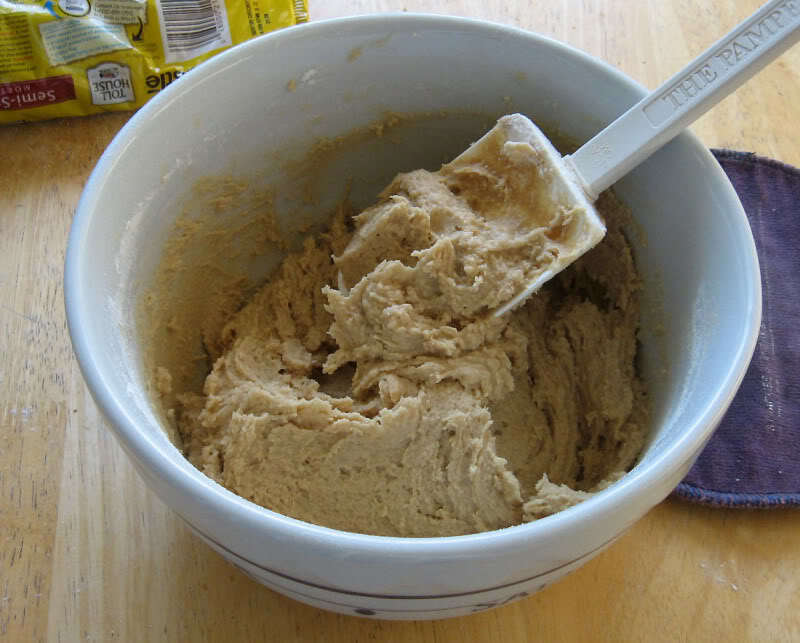 Add these dry ingredients to the butter mixture, mixing until just incorporated. Stir in the chocolate chips and then refrigerate in a covered bowl for 1-3 hours. Preheat the oven to 375°F. 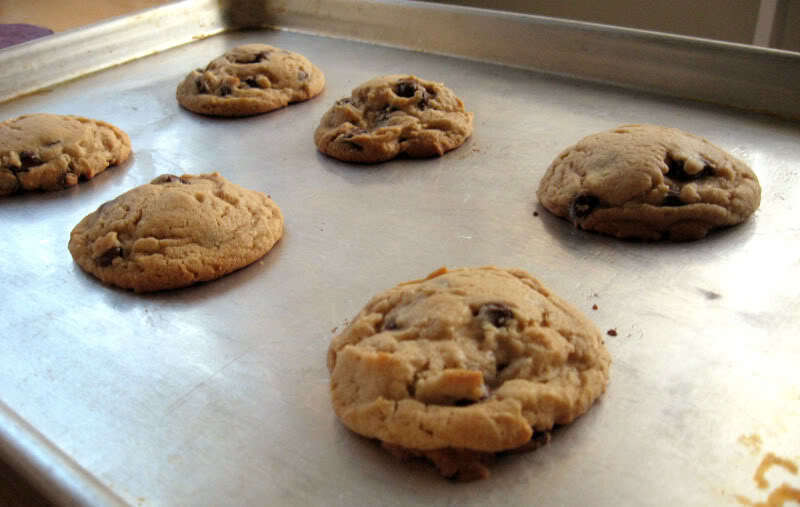 Drop cookie dough by tablespoonfuls (or use a cookie scoop like me) onto baking sheets. Bake for 10-12 minutes until edges are golden. All of the wet ingredients. I usually just do this recipe by hand with the spatula because it's pretty easy and there isn't so much that it's overwhelming. And the flour mixture is in. 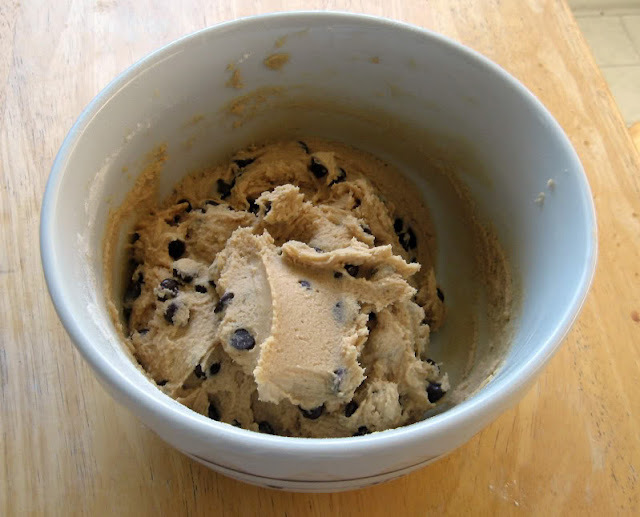 I once tried adding in chocolate chips after refrigerating dough. It is not a good idea. Fresh out of the oven, they are a little bit puffy. 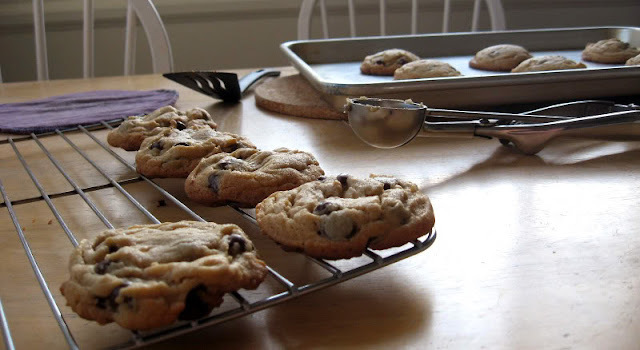 Give them a little bit of time on the cookie sheet, then remove to a wire rack to cool completely. Oh look, there's my recipe card! You get a glimpse at Jen's handwriting. Some on the rack, some on the sheet. All mmm mmm good. 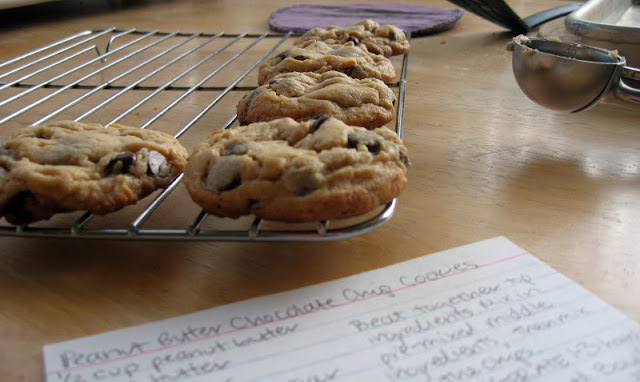 These cookies last pretty well for a few days in a cookie jar or other air-tight container. They almost always have a great consistency, and you can never eat just one. At least, I can't. Two? Three? Maybe sneaking a fourth? Yeah, it's been known to happen. You can probably also do these with crunchy peanut butter, but I don't really like cookies with nuts, even though I love crunchy peanut butter. Go figure. Haha - love that you use colored 3x5 notecards for your recipes as well. :) Mmmm - these look heavenly! Ha, yeah, I use what I have on hand! Maybe one day all of my recipe cards will be the same, but right now it's a big mish mash. Ryan made these for us tonight and they were so good! Just the right amount of peanut butter and lots of chocolate. This one is definitely a winner. I'm glad you enjoyed them! 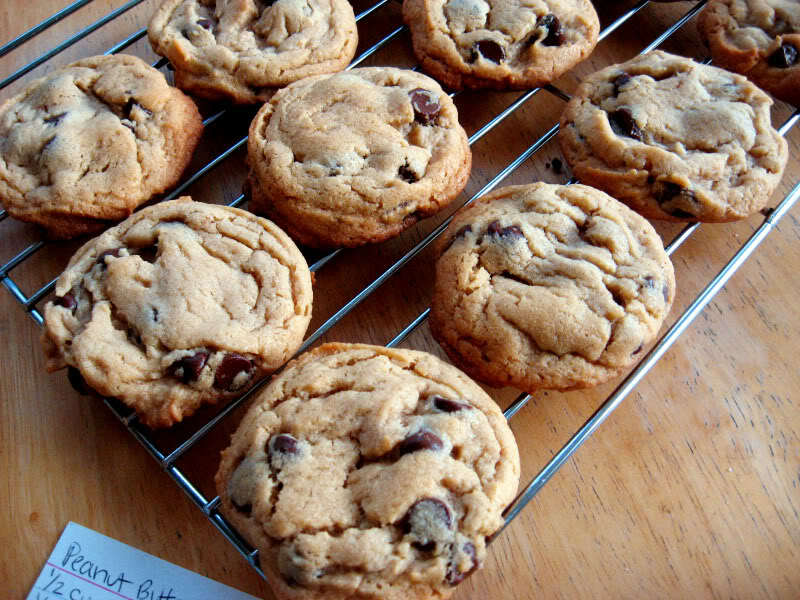 They are probably more of a "staple" cookie of mine than regular chocolate chip cookies, actually!